Portland Community College Newberg Center Newberg Center, a new construction project, was certified as LEED platinum in 2011 and also meets the rigorous Path to Net Zero program criteria from the State of Energy Trust of Oregon. 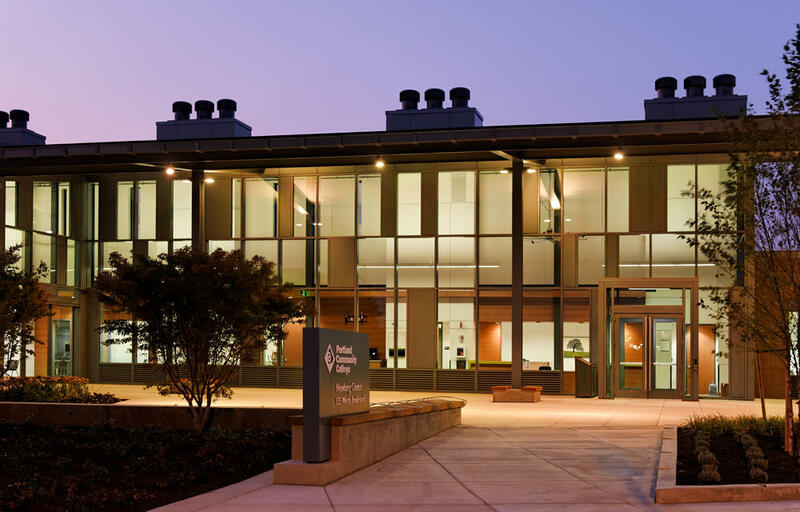 The Newberg Center is the first Energy Net Zero Readiness higher education building in the State of Oregon. Energy conservation strategies include hybrid natural ventilation, dual mechanical cooling system, radiant floor slab heating system, PV panels that cover more than 75% of the roof area, and state-­of-­the-­art lighting controls. More than 20 sub meters were installed and verified to track the energy consumption in various areas, and to ensure the energy conservation goals were measured and will be able to improve in the future. EPE was awarded prime commissioning authority to provide commissioning services for the Portland Community College Newberg Center. Mr. Jen was the Lead Commissioning agent for this 18,500 sf LEED-­NC registered building, which received a Platinum certification. All of the above mentioned energy related systems were thoroughly and systematically commissioned. EPE acted as the owner’s representative and interacted with the architect, MEP designers, general contractor, building administrator and operators, and all energy related equipment vendors and sub-­subcontractors. EPE performed 30%, 60% and 100% design reviews, incorporated commissioning specifications into the construction documentation, developed commissioning plan, conducted commissioning coordination meetings, participated onsite system startup observation, and ensured all owner’s training were adequate. Adopting industrial best practices, EPE developed all physical and soft trending points as part of the pre-­function readiness requirements, drafted rigorous functional performance test procedures, and confirmed the final functional performance demonstration to meet the design intent. EPE submitted a comprehensive final commissioning report which included a systems manual to PCC, as well as completing the required documents for the Energy and Atmosphere Pre-­request credit1 (EAp1) and Energy and Atmosphere credit 3 (EAc3) for PCC. The biggest challenges of this project were coordinating the gathering of multiple vendors for the functional tests, and dealing with a contractors resistance on collecting the necessary trending data. EPE perseveringly overcame the hurdle of coordinating with all the different vendors and contractors for participation in each of 24 functional performance test demonstrations within the hectic construction schedule. Furthermore, EPE invited the facility maintenance crew to participate in the functional performance test demonstrations, in order to gain more hands on experience for maintaining the various complex control systems. EPE also stayed dedicated and diplomatic with the control contractor about acquiring all trending analysis reports in order to analyze and optimize system performance in the future. The benefits of this foresight and perseverance was revealed when the control contractor company claimed bankruptcy by the end of the project. They were reluctant to complete their tasks during the functional demonstrations, and EPE alerted the owner and general contractor quickly so that the teaming coordination efforts would not lose momentum. Many building systems were still able to pass the functional tests due to the previously collected trending data that EPE made sure of acquiring. Also, review in advance was able to confirm that the entire commissioned equipment can repeat their needed performance in a timely and successfully manner.